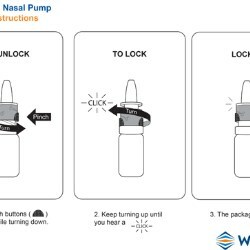 WestRock Company (NYSE: WRK), a global leader in paper and packaging solutions, announces the launch of the HiMark® CR Nasal Pump, which is now in use for nasal medications in retail pharmacies across the United States. The new packaging design was developed using patient insights and will facilitate a better medication usage experience. The new packaging integrates safety features that are both child-resistant (CR) and patient-centric. It was developed in advance of new regulations from the U.S. Consumer Product Safety Commission (CPSC) requiring CR packaging for any over-the-counter or prescription drug products containing imidazolines. 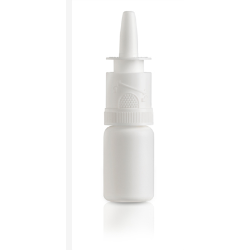 Imidazolines are found in commonly used nasal sprays and eye drops and are safe for directed usage but can cause serious adverse reactions in children when accidentally ingested. Regulations for CR packaging differ around the world, but the responsibility to consider CR packaging for medication goes beyond simply meeting regulations – there are best practices driven by the desire to protect children, make things easier for adults, and help companies get ahead of regulatory trends to deliver products safely and responsibly – that are driving manufacturers to implement CR more broadly. On-pack visual and tactile cues that communicate how to use the CR package. Use of a simple range of motion to open the pump, without requiring extreme precision, making the package truly senior-friendly. Audible indication and wiggle-free closure let users know they’ve closed the bottle securely. Integration of the CR feature into the pump versus the removable cap; this ensures the highest level of protection for children by preventing access to the medication even if the over cap is left off or lost. 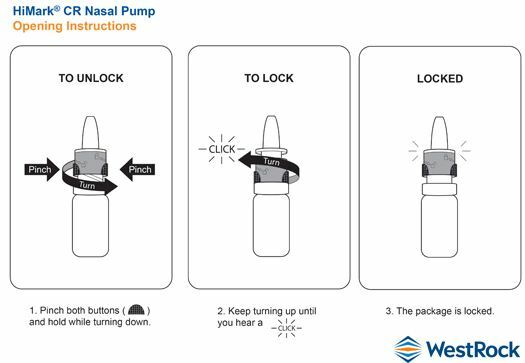 The HiMark CR Nasal Pump joins WestRock’s full suite of proven healthcare packaging solutions. WestRock Healthcare is a trusted partner to leading global pharmaceutical companies, retail pharmacies and contract packagers. Customers and consumers benefit from WestRock’s proven adherence-enhancing solutions, innovative designs for dispensing systems and closures, and expertise in CR and other aspects of the packaging regulatory environment.